If the output file path is LAN(Local Area Network) or NAS(Network Attached Storage ) path, you will get “invalid directory” error, and the method below will help solve that. 1. Open the Computer window by choosing Start→Computer. 2. Click the Map Network Drive button on the toolbar to open the Map Network Drive dialog box. To be able to map a network folder to a local drive, the folder must be shared and you must have network permission to access it on the other computer. 3. 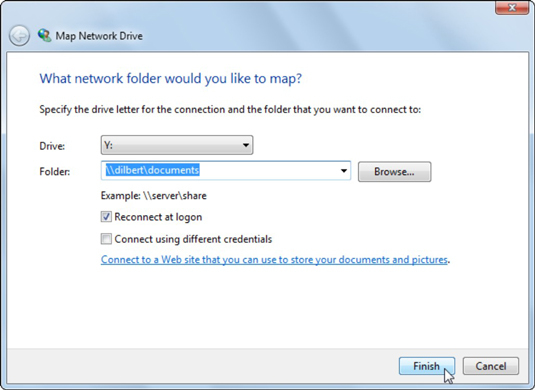 Select an unused drive letter for the network folder in the Drive drop-down list. 4. In the Folder text box, enter the network share path name. When you’re done, click OK.
You can type the path like the \\server\share example shown, or you can click the Browse button and locate the shared network folder. If you want to select a previously mapped folder, you can select it from the drop-down list of previously entered path names. 5. (Optional) Select the Reconnect at Logon check box to tell Windows to map this same drive every time you start the computer. Also, if you’re not an administrator, select the Connect Using Different Credentials check box. Then ask an administrator on your network to enter their user-name and password in the Windows Security dialog box that appears before you click OK. When you click Finish, Windows creates the network drive and automatically opens it in Windows Explorer. After that, you can access any of the folder’s sub-folders and files by simply opening the network drive in the Computer window. If you are still having difficulties after trying all of that, contact us with a screenshot of the error message.